We leave the tranquility of Battambang in Cambodia for the touristy Siem Reap. Coming from the suburbs into town, it soon becomes clear that not only penniless backpackers or travelers come to these part of the world: 5 star hotels and resorts line the streets, with spas and everything you need for a perfect all-inclusive holiday. Fortunately, there are low-budget accommodation as well, where you can find a room for $5 a night with TV, wi-fi, clean and fairly spacious. In the centre of ​​the city there are numerous souvenir shops, restaurants and bars, but unfortunately, as in almost all tourist areas of Southeast Asia, there are children begging or simply selling souvenirs and books on English, photocopied strictly for tourists who crowd these streets every day. 1. Ignore them, so that their parents, once and for all become discouraged to send them out on the street and earn and income for the family. 2. Give some food instead of money, a piece of bread for example, in this way they will at least have something to eat, instead of money that could be spent on the wrong things. Seam Reap is good; there is a pleasant, relaxed atmosphere, especially in the daytime, when most of the tourists are at the complex of Angkor Wat; we can’t afford not try the excellent cuisine of one of the Khmer downtown restaurants. One of our favorite dishes is definitely Amok Trey, a type of fish with coconut milk wrapped in banana leaves and steam cooked: a delicacy that costs only a few dollars.Another one of our favourite dishes is the Ka Tieu, pork and noodles served in broth with vegetables or Mee Kola, noodles in vegetables soup. On the first day we arrive in town, we begin immediately to arrange a visit to the archaeological complex of Angkor Wot: their are a couple of different options as well as costs (information about this will be covered in the third and final part of the series). Angkor Wat (“City of the Temple”) is a huge complex in vicinity of Siem Reap, about 200 km from the capital of Phnom Penh, built in the 12th century by the King of the prosperous Khmer empire. Angkor Wat was built as a royal temple dedicated to a Hindu divinity. This vast archaeological site is the best preserved example of Khmer architecture in Cambodia and is so unique that many of them place it among the Seven Wonders of the World. It even appears on the Cambodian national flag. In addition to the many tourists, many Buddhist monks visit Angkor every day: their robes, orange, form a vivid contrast with the gray of the rock from which these temples are made of. We decided on visiting the complex by bicycle, a tiring means of transport, but also inexpensive and “clean/eco”: in this way we would not depend on a driver that would bind us to his terms of time and schedules. We rent a bicycle each for $ 2 a day. What a deal: sure, they are not mountain bikes but simple, single speed bikes, a little old school retro style. The following day, at 5 am, we start riding our bikes towards Angkor Wat, located just over 30 minutes from our accommodation: we arrive just in time to watch sunrise, which slowly emerges from behind the main temple of the complex, a unique, fascinating spectacle. 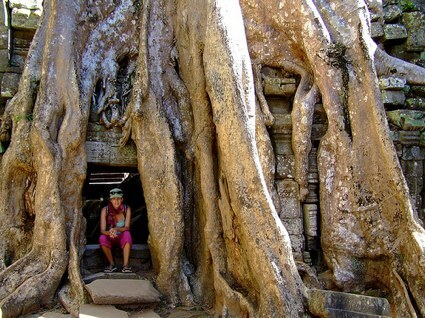 Our adventure and experience at Angkor begins this way: all day long, we’ll move from one temple to another, through ruins, blind alleys, doorways, passageways. It’s as though we are on the set of a motion picture (well they did filmTomb Rider here): we try to imagine life at the time of the Khmer empire and its people. For three days we go back and forth from Siem Reap, and every day is a different experience; we discover new places, entrances, passages; notice details lost in previous visits, hidden corners: we often and gladly stop in deserted quiet places, the tourists crowds hadn’t arrived yet, closing our eyes, listening to the sounds of nature, in total peace and harmony. We leave Seam Reap with a little bit of longing: leaving behind magical places, unique, strong and conflicting sensations, wonderful memories. One day we will return. One day not too far away. The last part of this series will be published shortly. Asia. I very rarely give them money (I do somerimes, though). And I had a great time with them, and they too. They don’t get peoples attention very often, you can see it in their eyes. Always very impressed with people who can manage the temples on a bike! I am not one of them.